Govt Forces Liberate More Villages In Eastern Aleppo, Reach Turkey-Controlled Areas (Map Update) 5 out of 5 based on 10 ratings. 10 user reviews. Syrian government forces, led by the Syrian army’s Tiger Forces, have liberated the villages of Sarbas, Husamiya, Deir Hanta, Um al-‘Amed and Tell Rahal from ISIS terrorists in the eastern countryside of Aleppo city. With capturing the village of Tell Rahal, the Syrian army de-facto reached the area controlled by pro-Turkish militant groups and the Turkish Armed Forces near al-Bab. There are almost no ISIS units in the area of Sha’alah. So, it cannot serve as a buffer zone between pro-government and pro-Turkish forces. 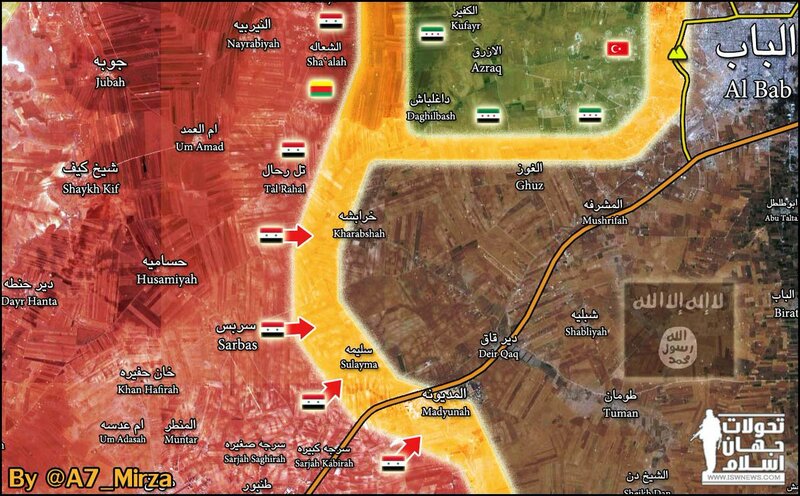 Previous reports by pro-Turkish sources and media activists that Turkey-led forces had seized the villages of Tel Rehal and Kharabishah were false. SAA can go for AL Bab now.See here why https://pbs.twimg.com/media/C279iltUAAAGfrA.jpg I think the distance is from 8 – 10 km.Few villages on the way. It would be the ultimate irony. Turkeys betrays its allies in Aleppo by trading the city for Al Bab, and then not being able to take it and see it go to the SAA and Assad, whom they hate.